Summer residence of the great statesman. Flower garden created by Claude Monet. Defeated in the presidential elections of 1919, “Père la Victoire” retired from political life. 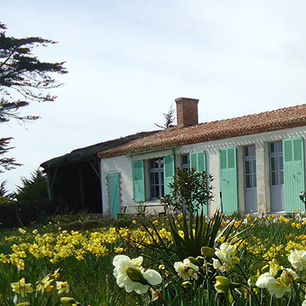 Between the ocean and his rented fisherman’s house, Georges Clemenceau, a close friend of Claude Monet, fulfilled the wager to create an Impressionist garden on the dunes. The house has been preserved in the same state as it was at the time the so-called “Tigre” died. Guided or accompanied tours only. Mondays from September the 16th to May the 24th. 1 January, 1 May, 1 November and 25 December.